There is science and technique to creating “smoke” bubbles when trolling artificial bait. Each fishing lure style: pushers, plungers, tubes, or bullets, moves through the water differently by design. The material you choose for your fishing lure skirting can compliment or compromise the head design of big game fishing lures. Smoke is the trail of bubbles that follows a skirted lure as it moves through the water. In this case, smoking is good for you. Different fishing lure skirting materials create different amounts of smoke bubbles. As a result, you must choose wisely. The three primary kinds of fishing lure skirting material for big game fishing lures are made of rubber, vinyl or synthetic compounds. Rubber lures are shaped like an octopus or a squid. In addition, they come in a huge variety of colors and patterns. Anglers who won’t spend five minutes selecting a new T-shirt, will spend ten times that contemplating the best color combinations for skirting a particular fishing lure head. 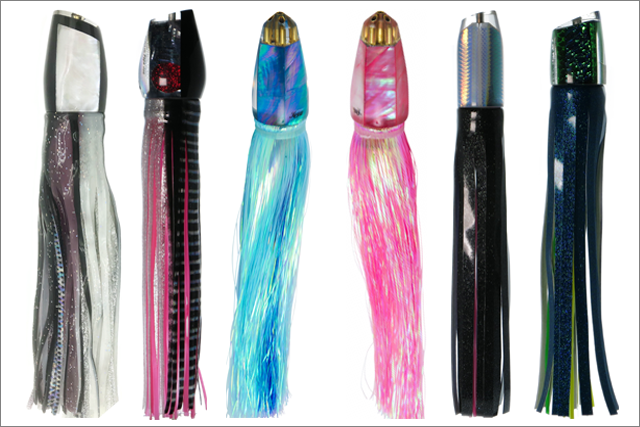 Flashabou® fishing lure skirts are made of nylon and other synthetic fiber compounds. They look like holiday tinsel. However, Flashabou® skirts come in colors that would make any Christmas tree green with envy. Furthermore, the material is lightweight and glitters and flashes as it shimmies through the water. The skirt colors resemble cotton candy. They look delicious and fish love them. Vinyl lure skirts are not pre-made. Vinyl comes in sheets that may or may not be cut into skirting strips/tentacles. Furthermore, when you skirt a lure in vinyl you must measure and cut the vinyl exactly to fit the circumference of your lure head. In addition, vinyl is available in limited color options. But vinyl skirts have benefits that more than compensate for any skirting inconvenience. For example, vinyl skirts are light and durable, a great benefit for larger lure heads. Vinyl skirts produce the most smoke. The rough underside of vinyl traps more air than the smooth surfaces of other skirt materials. Vinyl is also lighter than rubber or Flashabou®. Consequently, lighter material allows a lure to move through the water the way the lure maker designed it. For these and many other reasons, vinyl skirts are preferred for large marlin lure heads by Kona charter captains and anglers alike.